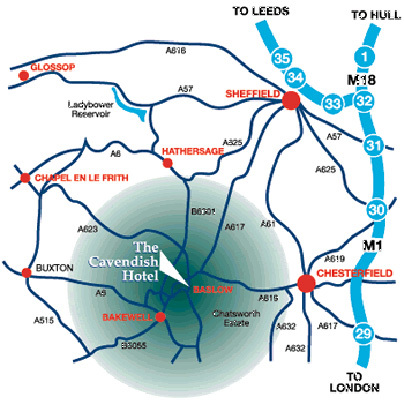 The Cavendish is operated by Peak Leisure Management on behalf of Chatsworth Trustees. A closely-knit team is dedicated to looking after guests as individuals, not simply room numbers. The Hotel exudes a quiet elegance; overlooking the Chatsworth Estate, an extensive collection of original artwork, antiques, charming furnishings and decor all maintained in a continuous programme of improvements and contributing to that elusive dimension - tranquility. Add to that the view from the window of your bedroom - no traffic, just fields - and you begin to understand the lure of the Cavendish. All the Cavendish bedrooms overlook Chatsworth Estate in The Peak District and are luxuriously appointed with twin or double beds, private bathrooms with bath and shower, direct-dial phone, computer modems, television, hairdryer, refrigerated bar and beverage facility. These are generally larger rooms occupying the original Peacock Inn. They include four-poster, brass or king-size beds, luxury bathrooms, fine art and antique furniture. Many feature original iron fireplaces. All superior rooms have DVDs. All tariffs quoted are inclusive of vat @ 20%. An additional 5% service levy will be charged on all goods and services supplied during your stay which is distributed directly to the staff. The room is designed for meetings, receptions or dining and can seat 16 boardroom style or 20 theatre style. The area is well lit, carries ample phone, TV and power sockets and has interlined curtains. A flip chart is available free of charge and audio visual equipment can be hired. For smaller meetings of up to 10 or private dining. Again, a well lit room with natural daylight with an intimate atmosphere. Reflecting an emphasis on fresh and exciting flavours, meals are stylishly presented in surroundings which include some interesting fine art. The menu emphasizes the use of fresh ingredients, often locally sourced, whilst seeking to create an unexpected twist here and there. Relaxed, informal service and stunning views of the Chatsworth Estate through extensively glazed surroundings. Food served from 10am to 10pm with a menu offering lighter style dishes, from open sandwiches to fuller meals to suit your requirements. The Kitchen Table is exactly what it suggests - a special table for two guests in the Hotel kitchen. Diners here are able to see for themselves what truly takes place behind the scenes, amid all the bustle of a busy night's service, while watching their own meal being prepared and chatting with the Chef. 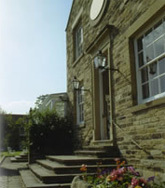 Ideally located for walking, set on the Chatsworth Estate in the heart of the Derbyshire Peak District. By car: From London 2.1/2 hours via M1 junction 29. 20 minutes drive from either Chesterfield or Sheffield. By air: East Midlands Airport 40 minutes by car; Manchester Airport approx. 1 hour by car; Helicopter landing pad.